Internet utopianism has tended to erase from memory immediately preceding communications "revolutions," and this applies particularly to the "paperback revolution," which brought books for the first time into millions of homes in the mid-20th century. 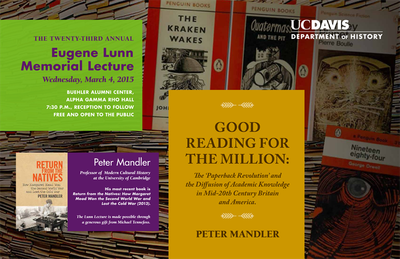 This lecture assessed the impact of the "paperback revolution" in the English-speaking world generally, and then specifically in disseminating academic knowledge well beyond those who were participating in the concurrent extension of higher education. Any assessment of the impact of "governmentality" through "technologies of the self" in the 20th century must reckon with these apparently humdrum but really quite potent mechanisms of education and self-education.